Really enjoyed your review. I bought a 10.0, read some stuff about mods back then. Is it worth it or just get a 10.1. I have a McIntosh MC225, I'm getting fixed up and it will be interested in compare the two. I'd suggest purchasing the newest 10.2 instead! As for a comparison with the McIntosh MC225 (that's a nice amp! )...I hope you will use speakers of adequate sensitivity, otherwise the TA 10 is going to suffer! I was LP enthusiast from my childhood, but only recently got in my hands Dynaco ST-70 and was completely amazed of great sound it produces. I like your site comments and tests of old audio gear. This helped me to get familiar with NAD, Sansui and harman/kardon vintage receivers. I do have old, bur serviced and working TT Pioneer PL-5 with ADC cartridge and XLM MKII improved stylus. I made some research and hope to get a new level of sound perfection by getting newest cartridge and may be a turntable. I have a problem, that in stores/audio rooms there is no option to hear various version of cartridges or TTs. I am listening mostly classic rock, classical and jazz. what phono cartridge in price range up to $300 you can advise to greatly improve of my sound, comparing with old ADC. Something that will give lot's of details on hi-frequencies, gives full range and increase wide presentation. Cartridge that will be enjoyable and at the same time fundamental in sound reproduction. Can I consider Technics 1210 series TT as good device to play audiophile quality records at home? What turntable can be recommended in price range up to $2000 that can realy show change in the sound reproduction comparing to my old PL-5? I'll value your advise and opinion. I'm pretty sure your PL-5 can be upgraded easily. Perhaps an entry-level ProJect won't do the trick but anything better than this and the difference will be self-evident. Hence, have a look at ProJect, Rega, Thorens turntables in the 500-700$ price range, they are certainly better than the PL-5. You don't really need to spend 2000$ to improve your turntable. As for cartridges, have a look at Grado's, Sumiko's and Goldring's. Of course, in order to detect differences between a turntable and another you need to be sure your phono preamp (and the rest of the system) isn't acting as a "bottle neck". Moreover, the quality of the recordings is of paramount importance: with old, dirty and poorly recorded LP's it will be hard to detect any difference at all. Last few months I have freqently visited the tests-page of your website. I find it very informative and helpful: so thank you very much. Very nice of you to add the month and year for new items: that way it's very easy to see if there's any new tests. I almost bought a Dayton DTA-1 (a copy of the Sonic Impact T-Amp I read about earlier on TNT-Audio) when I saw your Scythe SDA-1000 Kama Bay amp test. Yesterday I ordered the newer version (SDA-1100) and I'm looking forward to the listening experience. thanks for your kind words! There's a quicker and easier way to see which are the new reviews we add to our magazine week after week. Instead of browsing each and any products review section, just bookmark our What's new page. Week after week you'll find new articles listed there (new reviews normally each Saturday or Sunday). As for the Scythe amplifier, please let us know your findings after a short break-in. James here from sunny Queensland, Australia. Just been checking out your interview pertaining to Transcriptor turntables. I've had one stored away under the house for a number of years, and just recently; She, Who Must Be Obeyed, suggested a spring clean. So, with due dilligence, proceded with said task. Well, lo and behold, there it was. Fortunately, it still had the acrylic cover in place, which, by the way, bears the triangular logo from the "DESIGN CENTRE LONDON" making it one of the later models of Davids creations. Overall condition wasn't too bad, apart from perished belt, lack of fluid, etc. Was wondering what it might be worth in todays market place, or if you think it would be a worthy restoration project. Would appreciate any comments or advice on subject. Thanks for taking time out to read, if you deleted it, that's OK too. Down a tinnie and prepare to be pleasantly surprised. Your old Transcriptors will make great sounds today, that will blow away all inexpensive cd players (and most expensive ones too) and indeed outperform many modern turntables. If your soul remains intact do not sell it (the turntable not the soul) but restore it to pride of place in your sitting room or den. Any woman of taste will love it as a contribution to the sophisticated decor of the finest domestic interior, the Design Centre award proves this (do leave the label intact in place) and enables you to say "Darling! Look at the new designer accessory I've installed in the living room!". Michael Gammon, current bearer of the Transcriptor torch can supply most spares. Clean the bearing, lube with fresh oil and replenish the trough if it is a Hydraulic Reference. Clean the pulley surfaces with Carbon Tetrachloride if you can get it and handle it according to whatever draconian safety guidelines currently apply in your hemisphere or use available alcohol based solvents (e.g. vodka). Replace the belt (Michael has these in stock ready to mail). I do hope you get your old turntable restored to its former glory. The question remains, how on earth did your fine turntable end up lurking ignominiously beneath your house? You must do penance for this sacrilegious act at once. 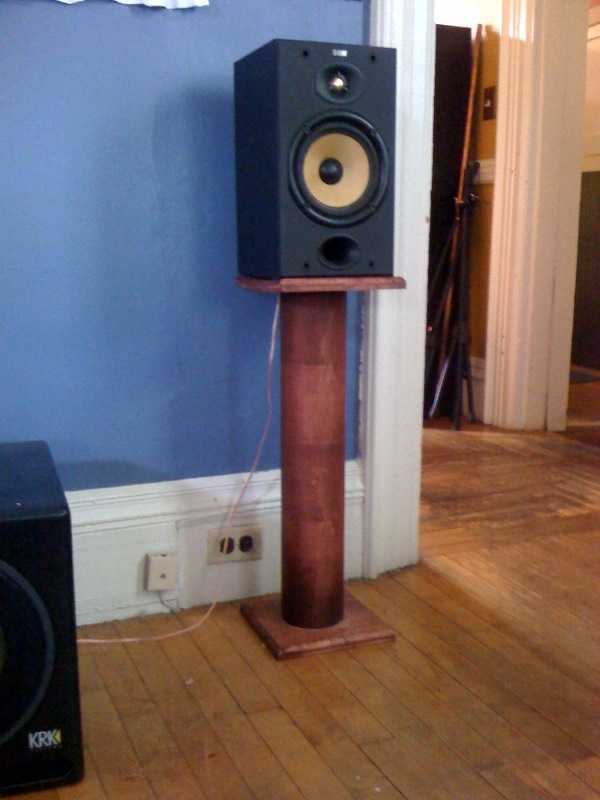 I found your speaker stand design and I built a surround set of them myself with a few modifications. I also took a few quick photos with my iPhone, and I'll take better ones with my D-SLR later for you. I found hard maple on sale at my local fine-wood store for $2.50/boardfoot and I got a single long piece of it. Then I got Schedule-40 (4") PVC pipe instead of the 3" with 3/8" threaded rods and bolts/washers. I cut the wood into 8x8 1/2" sections (except for the center channel which is much wider) and then routed the edges with a router. After a quick hand sanding I then drilled the center holes and countersinks with a hand drill (no drill press yet). Using a mitre saw I cut the PVC pipes straight into 24" lengths. Then instead of painting the PVC pipe black, I used maple pressure sensitive veneer that I wrapped the pipes with. This was somewhat difficult in getting the back edges straight. Make sure to sand the pipes first to rough them up and then clean them off with rubbing alcohol to remove oils from the pipe. Then I put them together pretty much as you did (although with no funnel), but first I stained each individual piece and used caulk on the inside bottom to help seal it up. They sound AMAZING. I'm actually shocked at how big of a difference it makes. My B&W speakers suddenly sound much deeper with strong bass. I thought my 5.1 sub was on, but it wasn't! There's also a strong center image suddenly, even with stereo only programming. Thanks so much for the great design. I'll take better photos for you soon. thanks for the positive feedback and enjoy your Stubby's! They do look cool. DIYing is a great resource for HiFi addicts on a budget. it all depends on your budget and room. The 3020 has very good driving capabilities but I'd hesitate to force it to drive highly inefficient monsters in large rooms. That said, I'd consider 87-88 dB/w/m loudspeakers at minimum. 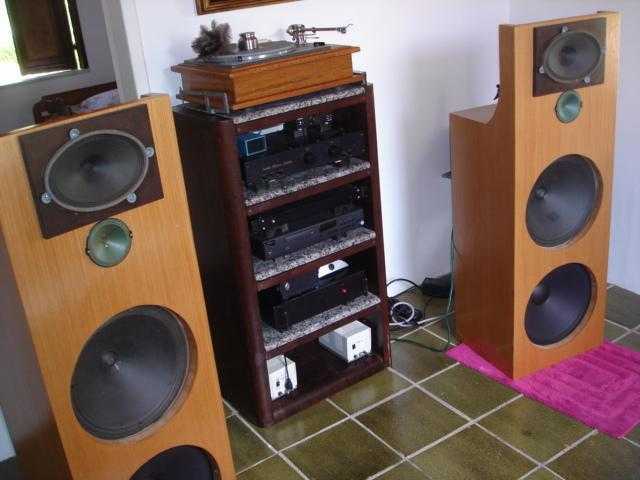 If your budget is tight, consider small floorstanders from the famous Diamond series of Wharfedale, for example (or even the new Vardus series). Also, you might consider Mordaunt Short and Tannoy, both make quite interesting and honestly priced floorstanders below 500$/pair. Even better, you might try to browse the second-hand market...sometimes there are absolute bargains on Ebay. I have a few comments on the power supply transformer. Large (>1KW) toroids have enormous inrush currents on switch on and should use surge limiters - this would explain the power tripping. A pair of 300VA transformers in dual mono would be cheaper, lighter and less troublesome than this monster. It's worth adding that the current waveform in the cable from the transformer to the rectifiers in the amplifier box is going to have a horrible harmonic content. The choke filtered power supply favoured by valve amp designers has a lot going for it. Was it Musical Fidelity who made solid state amps with chokes? and I have two separate hi-quality mains lines for my listening room. Just want to thank you for sharing the TNT DIY designs with the rest of the world! I have recently finished the UBYTE-2 speaker cable and I am very-VERY pleased with the result. I was already using 2 coax cables per speaker (cores only) for a couple of years and had found that to be an excellent (and cheap) solution for my setup (11m cable between amp and speaker). I was however curious for more improvement. When I found the UBYTE design and read the description I was immediately interested in building it. I slightly deviated from the design by making the lead-in and lead-out flex cables from CAT-5 cable (2 CAT-5 cables in parallel iso the proposed 36 twisted leads). I have it in operation now for a month and I must say that the improvement is incredible. For 80 euro's I now have 2x 11m of exceptionally good speaker cable. The big improvement over my old coax setup is in frequency range (top treble), transparency and speed. But also naturalness and "air" have improved a lot. I also freaked out my HIFI buddy who had bought new speaker cable recently for "normal" shop price (4x my price for 2x3m!). So, thanks again and keep up the good work!! thanks for the feedback on our DIY designs and happy listening! Among the accessories of frequent use "cones" are considered accessories that are located under the supports of the system to help control the vibrations that can affect the quality of HiFi sound reproduction. The prices vary enough, from reasonable until really expensive. To reduce the price of the installation I build my own furniture and supports. A while ago that I have found these accessories in hardware stores and bricolage stores. In Spain they are called markers, and they are used to mark (logical) the points where to drill when mounting boards on furniture, with some wooden cylinders as you can see in one of the pictures. There are them for several diameters of holes, until 10 mm, and the best that I have found are from Black & Decker. I use a board of aglomerate DM where I drill three holes (two in front and one back for stability) that don't end up crossing all the thickness of the board. I make them of 1 mm less than the diameter of the markers to be able to insert them with force. The price in Spain of a set of four is of less than 1 euro: approximately 1 dollar. The result is good, or better that most of the commercial supports, for a really ridiculous price. In the pictures of my system (at the moment in development state and with a completely provisional installation) you can see an equalizer. Not it is an error, my system is formed by a CD player AMC CD 8a with balanced output (that I am modifying) and a couple of active speakers Alesis M1Active 520 (also in process of improvement) the equalizer completes the function of a balanced preamp (the controls are excluded) until I can find the time to build my own. thanks for the tip! 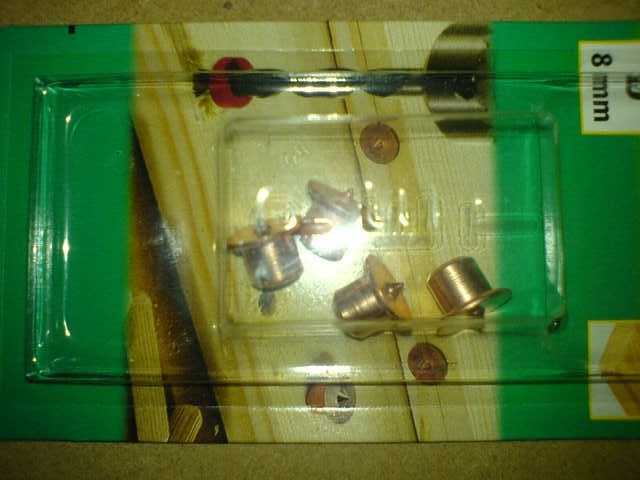 Bricolage and DIY stores are plenty of clever ideas for building HiFi accessories for peanuts. Cones and damping feet are the first things that come to mind...but you can even find damping paints, Teflon® sliders and even anti-RFI filters. Just one general advice: before worrying about cones, microvibrations etc. be sure to install your system in a more reasonable way. Microvibrations on CD players are nothing compared to the resonancies and ringings caused by your speakers playing one close to the other on a thin metallic shelf! Do not try to solve second- or third-order problems when there are first-order ones that need to be solved! If I had the necessity to buy a 180 wpc stereo power amplifier, in other words if I were using hungry loudspeaker systems, I never would buy this GR-180 from Genesis after reading your very honest and clear test of this amp. You deserve an honour medal for revealing to TNT readers those lemon pieces of audio gear. Fortunately I use very high efficient loudspeakers systems (OB Dipolar with 15" Stephens Trusonic 103-LX super big alnico woofer on one and Pioneer PW-15B super big alnico on other, Magnavox 15" big alnico magnet instrument woofers as midwoofers, Isophon 7" x 10" alnico midranges and Saba Greencone 4" alnico tweeters) whose demand are no more than 2 to 8 wpc at 4 or 8 ohms. What I have to say is: "Thanks Mr. Arnie Nudell for your very expensive amplifier stuffed with very cheap components and mixed bag sound" and continue to listen to my excellent new Scythe SDA-1100 (US$ 87 with freight and shipping to my city in Brazil) amp whose test of the early SDA-1000 by you give me the impulse to acquire as soon as possible. Even my old and thruthful Sonic Impact 5066 with 14V 5amp stabilized power supply give me results that are completely different from the vast majority of amplifiers that abound on the market to drive my OB system, and is only second to the new SDA-1100 and some very good single ended tube amplifiers like the excellent Music Angel King 845 (373 euros in Hong Kong) with modifications sugested by Lukasz Fikus on his now famous site www.lampizator.eu. 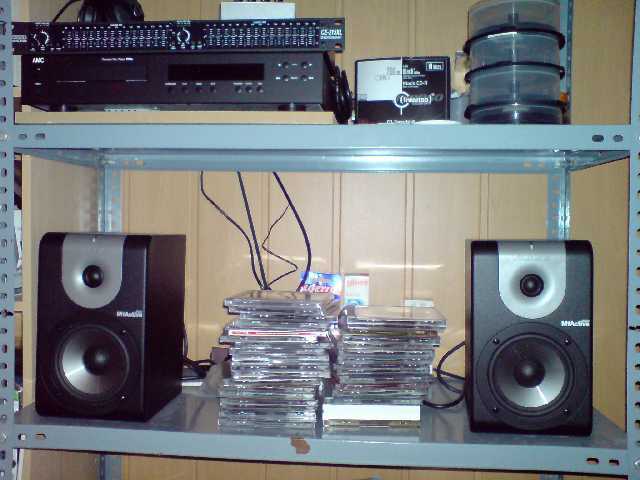 I am prepairing to send you some photos of my system whose sound let no margin to gross improvements thanks to very decent and honest approaching of the real music I heard on live performances. The new Scythe SDA-1100 has no more than few hours of use and at each moment the sound is improoving to new dimensions, the operational silence is indeed very great, the bass frequences are better than on my old SI 5066 and only the smoothness imparted to the sound at this very early stage of audition is what I wait to develop with the increasing use. Concerning your October 2008 editorial I have to say that Italy hasn't the worst taxes scenario in the world, this belongs to Brazil 60% (sixty per cent). The Tokyo Flash clock is really exceptional. Thanks again my dear "Direttore" for the creation and maintenance of this superb audio site that is "TNT-AUDIO.COM". thanks for your kind words. Just let me point out a couple of things. First, Mr. Arnie Nudell has nothing to do with the Genesis amplifier, as he sold the Company to Mr. Gary Leonard Koh before retiring from audio business. Hence, he is not responsible, in any way, of these designs. Secondly, the GR180 does sound _much better_ than the chip amps you mentioned, Scythe SDA-1000 included! Indeed, the GR180 does sound pretty good, and my complaints were mainly focused on build quality (noise problems etc.) and price tag, way too high considering what's inside the amp. On the other hand, one shouldn't forget the price difference between the GR180 and those chip-amps: trying to find a relationship with the difference in sound performance could be embarassing, I admit. The same happens with any other expensive amplifier when compared with these small chip "miracles". I have a small audio set up at my home. I like the quality of sound of my system very much but somehow I miss the punch in the output and to get some impact I have to raise the volume of my amplifier to almost 50% and sometimes even more. This becomes very disturbing for my family members. The room size is 9mts by 5 mts. I am planning to replace my amplifier with NAD 372. Please let me know if my decision is correct and would provide me the satisfaction that I am missing. I'm quite sure the problem you are experiencing with your set-up has nothing to do with the amplifier. The NAD C352 has enough power. The problem is the room which is quite large and, I suspect, mostly empty. In such rooms, in order to get punch and impact you need to turn the volume up because stationary waves and strong, early reflections are killing the sound. Try moving the speakers around, change the listening position and fill the room with absorbing furniture such as carpets, pillows, heavy curtains and the like. A new, more powerful amplifier won't improve your system since you wouldn't be able to exploit the extra power. A good place where to start with room acoustics is Mark Wheeler's first chapter on domestic acoustics here on TNT-Audio.